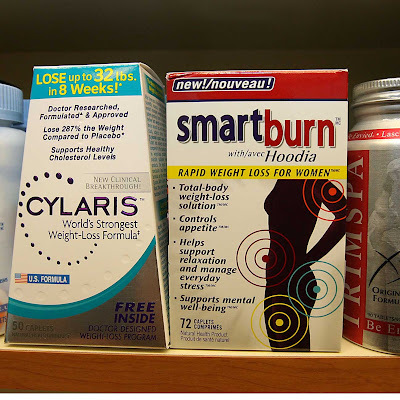 Weighty Matters: Want cheap prescription weight loss drugs? Buy a "natural" product. Want cheap prescription weight loss drugs? Buy a "natural" product. Some people swear by their "herbal" remedies. You know when I opened my offices I scoured the medical literature hoping I could convince myself that there was a herbal supplement that I could sell patients that would help them lose weight and help me pay salaries. I don't sell any products. Oh, yours works? Maybe it's because its got prescription weight loss drugs mixed into the "natural" pills. At least that's what a recent FDA sting operation found out when they found prescription weight medications (including some not sold in the US) in 68 different "natural" products. Why put these into the "natural" products? Because the expensive part of coming up with medications isn't manufacturing them, it's the research and development behind them. Spend pennies a pill on making a herbal weight loss product work by putting in drugs that actually affect weight and now you've got a "herbal" product that people will keep buying. So what drugs did they use to taint the pills? If weight-loss in a bottle existed the world would be skinny.